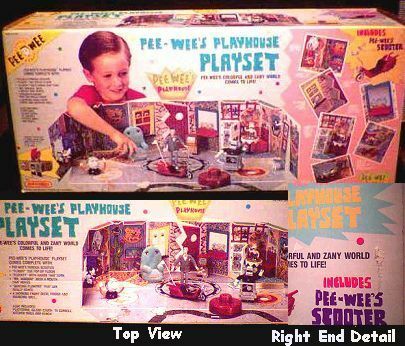 This is a mint-in-box "Pee Wee's Playhouse Playset" made by Matchbox in 1988. The box is still sealed and has never been opened. There is a clean, straight razor knife mark across the top (from when the case was first opened in the store and the stock clerk was a little heavy handed with his cutter), but I don't think that the cut goes all the way through(top view photo shows razor mark running horizontally as a line at the top of the scooter body). On one end of the box, there is a small half-inch scrape (see photo detail), and about a three-inch superficial razor knife scratch. Other than these few store-inflicted marks, this toy is factory fresh and perfectly mint. Includes Pee-Wee's Scooter along with "Floory", "Clocky", "Mr. Window", "Dancing Flowers" and other accessories. Please, take your time. Look all you want. But if you're lookin' for something in particular, try using the viewer item selection filters to the right. Your settings are combined so you can get real specific, like looking for Sci-Fi books with the word 'Trek' in the item name. Website design and hosting by Sohodojo Business Services. Item 280 of 466 items displayed in viewer. 0 items in cart.